Arval full service car leasing solutions are delivered in 29 countries by around 7,000 employees. Last year, Arval leased fleet grew by 8.2% overall, reaching 1,193,910 vehicles. The number of vehicles ordered increased by 9% year-on-year, totaling 353,302 vehicles. The number of end-of contract vehicles sold was flat versus 2017, totaling 254,207. The four key geographies of Arval posted excellent growth figures: France +5%, UK +5%, Spain +19% and Italy +8%. Double-digit growth was booked in many other areas such as in the Benelux (+12%), Southern Europe (+16%), Central Europe (+14%) and the Nordics (+25%). Last year, Arval grew across all corporate client segments, with +4% in the Corporate & Public segments and +17% in small and medium enterprises. The international clients of Arval stood for an organic growth of more than 7% and now represent more than 25% of the overall business. In 2018, Arval successfully rolled out its offers for private individuals in Europe, the private lease fleet having increased by +45% between 2017 and 2018. In the Netherlands, Arval has launched an online car store for private customers where they can select the car that best suits their needs and lease it through an all-inclusive, hassle-free service package. The goal is to introduce this new qualitative customer experience across several other European countries in 2019. SMaRT“: Arval has developed an innovative approach called SMaRT – Sustainable Mobility and Responsibility Targets. In the wake of a clear acceleration towards greener mobility across many European countries, this 5-phase proposition is used to help clients define and implement their fleet energy transition strategy. The SMaRT methodology is designed to satisfy the changing needs of clients in building their energy transition strategies and help the fleet managers throughout their execution and follow up. This approach is part of Arval’s promise to deliver objective added value expertise to its clients at a time when making fleets greener is key. “Arval’s Electric Vehicle Offer“: Thanks to its strategic partnerships with several OEMs (Original Equipment Manufacturer), energy providers and charging infrastructure & services suppliers, Arval’s Electric Vehicle offer covers the whole Electric Vehicle (EV) ecosystem, including home and workplace charging point installation, integrated payment solutions (with automatic home charging reimbursement) and Electric Vehicle digital services (consumption tracking and charging point location). Attractively priced, it allows trial periods and additional services, including a petrol/diesel vehicle replacement option for short periods such as holidays. It is now available in 12 countries including France, the UK, Belgium, Norway, the Netherlands and Germany and is being rolled out in several EV mature markets. “Arval For Me“: through this digital solution, Arval extends its offer to private individuals giving them access to its know-how, added value services and networks. The Arval For Me offer gives its members full access to a unique range of services including maintenance and repair (bodywork, tyres, windscreens, etc. ), as well as directly linked mobility services (relief car, door-to-door pick-up, towing). This platform is currently available in Italy and Spain with about 12,000 members. Arval’s strategy for the coming years is all about further growth, fostered by more innovations and digital applications fit to offer a broader range of mobility services to its clients and prospects. Arval has recently launched its new Employee Value Proposition to underpin the importance of empowered people driving this strategy and delivering outstanding service and industry expertise to its customers and drivers. The My Arval platform allows customers and drivers to interact and get personalized and proactive information and services whenever and wherever they need it. Based on its solid experience in full service leasing and thanks to the richness of the data Arval collects in this domain throughout the lifecycle of its vehicles, Arval benefits from huge opportunities to improve its customers and drivers experience, as well as add value in terms of solid advice. Better and fully exploiting these data will enable Arval and its partners to stay ahead of the game and offer clients and prospects the best possible advice, services and innovations, including in the area of green and alternative mobility. On the Human Resources side, Arval just implemented its employer promise, “A place for people in action”, committing itself to giving employees the resources they need in order to bring forward new ideas, deliver performance and grow. Alain Van Groenendael, Arval CEO, concludes: “As our unique spectrum of high-value services meets the positive market trends, we are confident that we will achieve significant growth in 2019. Our teams are engaged in all countries and segments and achieving a 9% growth for the year ahead seems within our reach. Our integrated offer, strong assets, and the course set on data and digital will enable us to meet our clients’ mobility challenges, including our responsibility to fight climate change”. In 2018, Arval Luxembourg confirmed its position as a major player on the operational leasing market in Luxembourg. The company recorded a steady increase of +17% in its fleet in 2018, bringing the number of leased vehicles to more than 7,000. This increase, which is more than four times the Luxembourg market trend for operational leasing, confirms the growth started several years ago and remains on track for future targets. Arval Luxembourg confirmed its “Best Workplace Luxembourg 2018” certification awarded by the “Great Place to Work” Institute in recognition of the high-quality working conditions it offers its employees. This award, which is testimony to the well-being of Arval’s employees, is the result of the excellent dialogue between management and employees. The offer of leases ranging from 1 to 24 months, Arval Mid Term Rental, launched more than 2 years ago on the Luxembourg market, confirms its success with close on 25% growth in the number of bookings. This solution meets the flexibility needs of businesses in Luxembourg to cope with activity peaks, seasonal activity or different phases of recruitment (e.g. trial periods, fixed-term contracts). 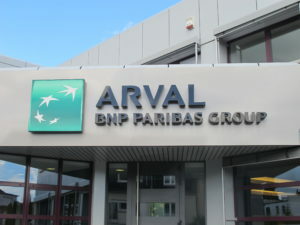 In January 2018, Arval Luxembourg joined forces with BGL BNP Paribas to launch Private Lease, a long-term vehicle leasing offer for private individuals living in Luxembourg via BGL BNP Paribas’ branch network. “Thanks to Private Lease, individual customers can now benefit from the financial advantages and convenience of operational leasing, which were previously only enjoyed by our professional clientele”, emphasises Gerry Wagner, Managing Director of Arval Luxembourg.